1. ±4mm Adjustable flanges for stroker or narrower engines. 2. Sport muffler for engine up to 125 HP. 3. 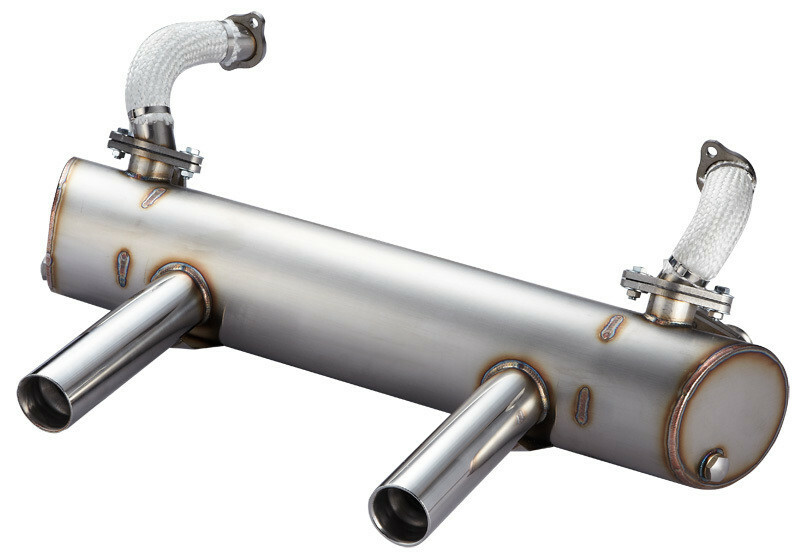 SuperFlow muffler for engine up to 150HP. 4. 100% #304 stainless steel muffler, tail pipes and headers. 5. Build in M18x1.5 nuts for Lamda sensor when tuning carburetors. 6. Fiberglass fire sleeve on #2 and #4 header pipes were designed to protect fresh air hoses. 7. Use original 111 298 051A gasket for heater box. 111 298 051A gasket sold separately. 1. Factory Type 181 style heat riser. #2 cylinder positive pressure side. #4 cylinder negative pressure side. 2. Flange adaptors for muffler to flange heater box. Heater box 35mm flange sold separately.